Jesus tells a parable about what His followers should be doing while they await His return. Can we find ourselves in it? From its context in St. Matthew’s Gospel, we know that today’s parable touches again on being prepared for the arrival of someone who has been gone a long time. In the verses prior to our reading (Mt. 25:1-13) is a parable about the wise and foolish virgins who had to endure a “long delay” before the arrival of the bridegroom at a wedding. 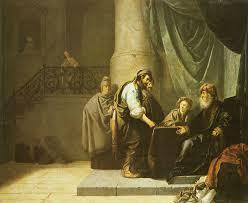 In today’s reading, we learn of a master who went on a journey and entrusted his possessions to three servants. The “talents” represent sums of money, and he distributed them unevenly to the servants, “each according to his ability.” We are not completely sure what the word “ability” means, but, since it is clear that the master expected a return on the money he gave each servant, “ability” may refer more to “opportunity” than to skill. Servants who had business that took them into the marketplace or gave them many contacts with money and goods would certainly have had more “ability” to make a good return on money. Domestic servants, however, whose primary work was within the household, would have much less ability to trade and make a profit. We should note the trust that the master placed in his servants. It was merciful of him not to give any one of them a greater responsibility than he could manage. The money was his, from beginning to end. Was the master interested in the volume of profit that would be his when he returned? Was he a mercenary, greedy man, or was this distribution of his possessions for some other purpose? We see that two of the servants sprang into action, doing exactly what the master asked of them, with great success. Notice that the second servant, who had only received two talents, showed no jealousy, bitterness, or resentment over getting a smaller amount than the first servant. He must have understood that the amount was well-suited to his “ability,” or opportunity, to trade. The third servant, however, surprises us by his response. He went off, “dug a hole in the ground and buried the master’s money.” Before we find out any more about this fellow, what does his behavior suggest? His response to receiving the master’s money and instruction is radically different from that of the other servants. There is something inherently disrespectful and even mean-spirited in treating the master’s money this way. What is happening here? As Jesus finishes the parable, we discover that, indeed, the master’s distribution of his talents to his servants was not about the increase in money but about their faithfulness. Even though he had been gone and could not see them, they did exactly what he asked of them. The reward for both of the faithful servants was exactly the same, even though they had been working with different amounts of money: “Come, share your master’s joy.” Here we see more of the kind of man the master was—he used this investment task to elevate his servants into true fellowship with him. He’s a fellow we have to love! However, the third servant is now revealed to have had a troubled relationship with the master: “I knew you were a demanding person…so out of fear I went off and buried your talent in the ground. Here it is back.” What a volume of venom spews out here. The servant accuses the master of being unjust and expecting what he doesn’t deserve. What did the servant “fear” in this master, who has given no signs of being anything other than just and generous? Perhaps the servant feared that the master would get any return on the one talent in his charge, so, instead of putting it in the bank, where at least it would earn interest, he buried it in the ground, making it dead to the master. It was an action of spite and bitterness against a master whom he perceived to ask too much and give too little. What did Jesus mean by telling this parable? If we think of Him as the good master Who has gone away and left us a portion of His possessions (graces), in accordance with our “ability” (our vocation in life), then the point for us is to make that grace as fruitful as it can be, no matter who we are, where we are, or what we are doing. However, if, in our vocations, we resent the work He asks us to do, if we measure ourselves against others, and if we allow bitterness over our particular circumstances to blind us to our simple need to be faithful in our obedience to Jesus, we can end up as miserable and bereft as the servant who lost everything. The key to this parable seems to be: do we want to please our Master or ourselves? Our vocations are given to us as our opportunity to invest and make fruitful the graces we have received in life. May this parable serve to remind us never to think that the Lord is asking too much and giving too little in them. Possible Response: Lord Jesus, I need this reminder that my vocation is where I am meant to increase what You have given me. Help me do this today. This reading is a splendid example of a person who makes her vocation fruitful, as Jesus urged us to do in the Gospel. In ancient Israel, when this proverb was written, a wife’s vocation usually meant that her activities were primarily domestic. Yet look how completely this wife gives herself to the work at her hand. Her husband is willing to entrust his heart to her. She is a source of “good, and not evil” not only to her own household but to the poor and needy outside her home as well. This woman’s beauty is not the kind that ever fades away, because it comes from her reverence of the LORD. Her love of God enables her to do her domestic work without resentment, without regarding it as drudgery. She will receive “a reward for her labors,” just as we will if we fulfill our vocations with the love and energy we see here. Possible Response: Heavenly Father, thank You for this picture of a fruitful vocation. I long to bless others this way, too. Possible Response: Lord Jesus, I need Your supernatural help to live as if each day is my last, to be “alert and sober,” ready to see You.